The shop vac should turn on when a tool turns on – this is a simple one but its the base functionality to which we build off of. Provide the ability to run small loads off the system without turning on the DC. Provide the ability to connect multiple tools to the system, all which can independently turn on the DC. Provide the ability to keep the DC on for a variable amount of time after the tool turns off. Provide the ability to turn on the DC for other purposes like cleaning the shop or sanding. Provide the ability to actuate a blast gate when its specific tool turns on. 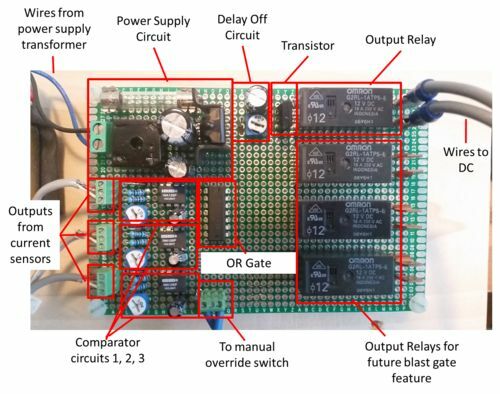 Provide the ability to delay the start of the DC for a variable amount of time once the tool turns on. 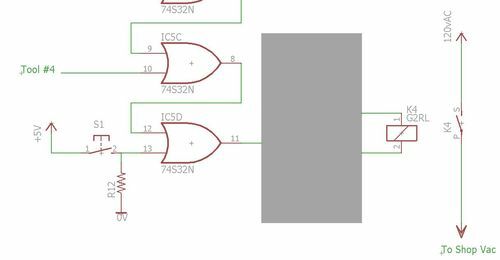 The first goal is the overall system will be completed in this post and number 2 has been achieved by the comparator circuit in the last post. In this post we’ll take care of goals 3, 4 and 5. Goal number three is intended so you can have multiple tools all controlling the dust collector. 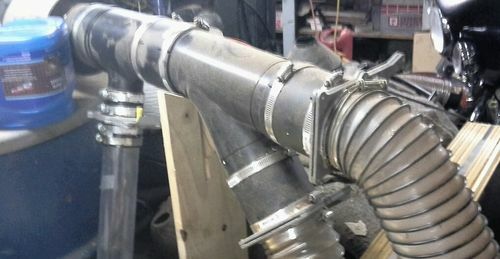 For my original design I have the ability to use three tools each of which can trigger the dust collector to turn on. 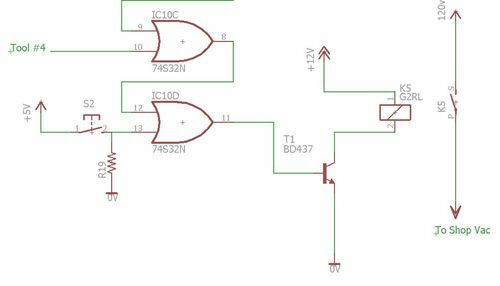 At the end of the last post, the output signal into this next stage is a binary signal that is 0 volts when the tool is off and 5 volts when the tool has exceeded the current threshold set by the potentiometer. So we essentially have a digital binary 5v signal or a 0v signal. 5 volts will be considered as digital “1” or true or high. Zero volts will be considered “0” or not true or low. 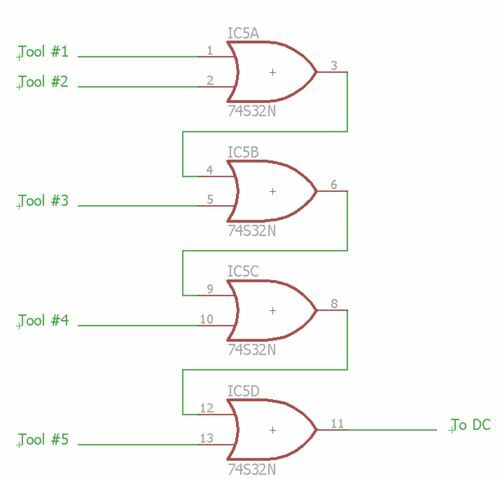 Now we can use digital logic gates to combine the outputs from copies of the circuit we have up to now and control the DC. Since we want tool #1 or tool #2 or tool #3 to trigger the DC we need a OR gate. If you want to read more about digital logic and gates read this. The three main things to consider when picking a transistor is the type, current rating and on voltage. 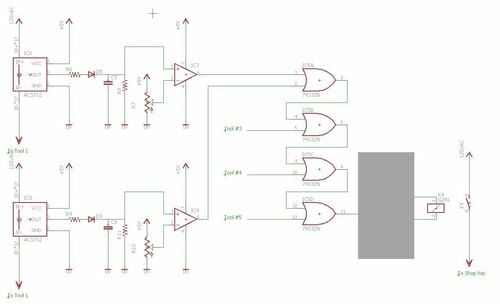 Since we are connecting the emitter to ground and a high signal should turn on the transistor we need a NPN transistor. 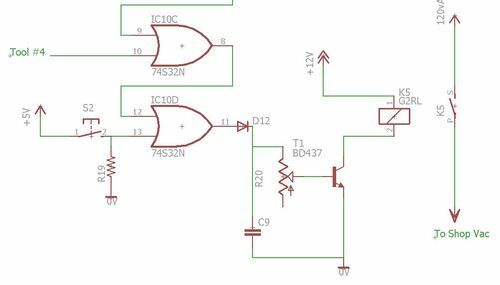 Secondly, you will need to find a transistor that can handle the amount of current the relay coil will draw. In my case the Omiron relay draws about 33mA when powered with 12volts so the transistor will need to have the same or more current capability. And finally, it needs to be actuated by the 5 volt signal. So the Vbe (base emitter) breakdown voltage should be 5 volts. For my build I used a NPN transistor, which can switch 4A (overkill) and has a Vbe of 5volts. Its made by a company called OnSemi and is part number BD437 . The 4th design goal is to have the DC only turn off after a set time delay to allow it to clear the lines. We can achieved this by manipulating the signal right before it goes into the transistor. What we want is for that 5v signal to be present at the transistor base even after the signal from the OR output goes back to zero. Then that 5v signal should start to slowly lower at a adjustable rate until it passes the transistor base emitter minimum on voltage. So at this point we’ve designed the complete system and achieved 5 of our initial goals. This is the same exact system I originally designed about a year ago and have built and used. For someone who doesn’t have experience building this type of electrical part, it may be hard to envision the physical system based off a set of schematics. So let me try to provide a link between the two here. This is a picture of the circuit board I built with some callouts linking components to the schematic. In the next post, I’ll explore the two additional features in our list that I haven’t implemented and provide more pics of the overall system. Until then, thanks for reading and please let me know any questions or comments. I’m interested in actuating the blast gate for the corresponding tool. I have a switched outlet in a j-box and the dc vacuum manifold is within reach of my seat.